It has been a lot of fun to start sharing with you over the last few months the work that Microsoft is doing to using the RadControls on their various sites. Today I get to share another exciting Microsoft implementation. The CodePlex Wiki is now using the RadEditor on all Project Discussion pages. 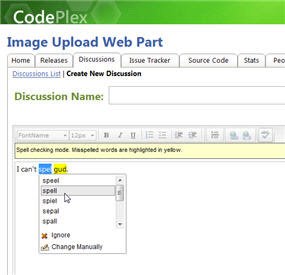 The Editor implementation is relatively simple, but it makes the process of adding formatted content to the CodePlex discussions much more intuitive. If you're an active user of this community resource, hopefully you'll enjoy the improvement! We're all very excited at Telerik to be able to keep providing you with these great "real world" examples of our controls in action. I've said it before, but it's worth re-iterating: awards and trophies are great, but solid real world uses of the RadControls on huge, high-volume sites like MSDN, TechNet, and CodePlex are much better proof the quality of the work we're doing. If our tools are the choice for some of the most active sites on the web, there is no question they can support the demands of your next project. In fact, do you have any cool implementations of the RadControls you want me to feature? I'd love to show-off your work with the broader community, so if you have a public site that features the RadControls that you want me to highlight, send an email to todd[dot]anglin[at]telerik[dot]youknowwhat. You may just find your site as the next great "real world example" of the RadControls featured on this blog!